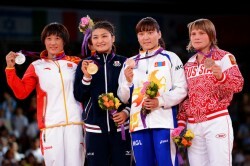 US Wrestler Clarissa Chun takes bronze! As a local resident, the London 2012 Olympics has offered a unique opportunity to see some great sporting action and I was delighted to attend the women’s freestyle wrestling finals last night. We were in the house for the 48kg and 63kg medal matches and ceremonies. The crowd was fantastic, with a particularly strong Japanese contingent filling the 10,000 seat auditorium; Poles, Canadians, Azerbaijanis and Mongolians were also out in force to support their wrestlers with a few Stars and Stripes and Union Jacks thrown in for good measure. Icho working for the takedown; more than one cringe-worthy moment for the knee warrior that evening! Alternative grappling disciplines, or more accurately how the competition rules have influenced the development of individual disciplines, can often seem a bit strange through the BJJer’s eyes (I’m sure this cuts both ways!) and while it is odd to watch a player lay stomach-down spread-eagle to base out and prevent being rolled to her back – and thus positively beg for an RNC – the athleticism, intent and technique of the wrestlers was impressive to behold. It was a veritable feast of single leg takedowns with some especially impressive single leg takedown defence from Mongolia’s Battsetseg Soronsonbold, who went on to take the bronze in the 63kg group. Once on the floor, the wrestlers showed great bursts of power and the super nimble 48kg Clarissa Chun of the USA was a fierce ‘scrambler’ and ‘reverser’ on the mats. The women from Japan, however, dominated the event and Obara took gold in the 48kg group while Icho did the same for the 63kg group. What was most eye-opening and exciting for me, however, was how different cultures have a totally different appreciation for female wrestlers than in Anglo-American culture. Of course, there are plenty of Anglo-American men and women who appreciate and respect the skills of female grapplers, but the main stream support for female wrestlers, especially by the Japanese was thrilling! Japanese spectators clearly dominated the event and showed a massive amount of support with flags and banners and hats and all the other paraphernalia Olympic supporters bring to events. Three generations of Japanese sat together in the row in front of us and while the whole family chanted in support of their representatives, the teenage boy just about had an aneurism shouting and urging on Obara and Icho; awesome to see so much respect and enthusiasm for women’s wrestling! The Poles, Mongolians, Azerbaijanis and Canadians were no shrinking violets either and included significant sets of loud and proud fans. While there’s been some questionable discourse and activity around gender and the 2012 Olympics, this year has included the exciting milestone of women representing every country and it was great to see so much heartfelt support for these wrestlers to inject some positivity around gender and sport. Amen, Chris! Some really nice side control work by Chun during her bouts – how can someone that’s 48kgs be such a brick house?! Tremendous athletes all round. I was happy for Clarrissa as us British having only one representative in the wrestling I have adopted the Americans as my team to support . Come on Jordan burroughs !